Throwback Thursday: Spinning the Wheel of Fun! At the Chamber, we've recently undergone a renovation of sorts, which has featured a good deal of fall cleaning. A carousel slide projector is a common form of slide projector, used to project slide photographs and to create slideshows. The first carousel slide projector was invented by Louis Misuraca, who immigrated to the United States from Naples, Italy when he was a child. Louis was paid a one-time fee for his invention by the Eastman Kodak Company and did not earn royalties. He used the money to take his family on a trip to Italy. 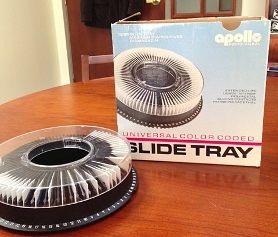 The carousel slide projector was highlighted in the popular TV-series "Mad Men" (Season One, Episode 13, titled "The Wheel") as a product for advertiser Don Draper to pitch. There, it was named the "Carousel," instead of "The Wheel", because it was nostalgic and let its viewers travel through their memories as a child would, "around and around and back home again to a place where they were loved." A common series of carousel projectors with a horizontally mounted tray was introduced in the spring of 1962 by Kodak (Kodak Carousel/Ektagraphic). The earliest Carousel models (mostly known as the 500-series) are compatible only with the 80-slide trays. During the 1970s, Kodak also produced a Pocket Carousel projector for use with miniature 110 format Kodachrome slides. Hat tip to Chamber staffer Katie Coffin for bringing this gem to our attention.